Ortofon has publicly stated its aim to be the ‘last firm standing’ if and when cartridge production ever dries up. Luckily that sad end seems to be nowhere in sight and the firm’s range is still enormous and easily the widest on the planet. What’s more, several of that range are all-new designs, including the 2M series, among which the Red is the base model. Its design is striking and evidently influenced by the facetting of gemstones, appropriately enough. The body is actually made of plastic, with a metal top plate in which are tapped holes for mounting to the headshell. 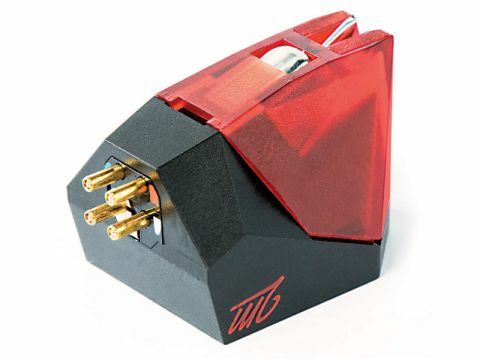 This is by far the most convenient way of mounting a cartridge, but do take care not to use over-long bolts which could, if tightened carelessly, do a lot of damage! An elliptical-profile diamond is used and the generator assembly uses split-pole pins – these are part of the magnetic circuit and the idea is to improve extreme treble response, which is typically a weak point of moving magnets. Bass is assured, not quite as full as some but that’s probably a good thing. We found tracking very confident across the recommend downforce range, so settled on the minimum, 1.6g. VTA is unusually critical for an elliptical stylus, though the arm height was about average in the end. It’s worth experimenting, because at best this is one of the most detailed cartridges we’ve come across at this kind of price.